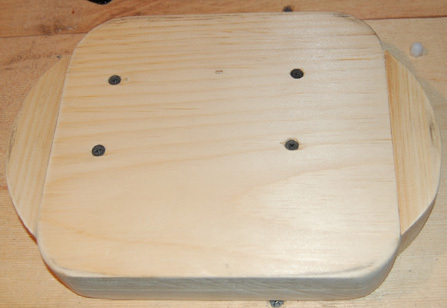 Fresh off of the completion of “The VrgeN64“, I began work on a new, more polished model of the Portable Nintendo 64. This was to be a whole new design which required a whole new approach as to how I was going to tackle this. Granted I had still learned over 100% more than what I had known with the VrgeN64, I still had only been modding for 6 or 7 months on a whole, so there was still much to learn, especially now I was going to be using the horizontal format for the system. The idea was a simple one, but admittedly the ears were an afterthought. However I am very glad they were there as adding them to the size helped incredibly. Though it didn’t seem like it at the time, this system was actually pretty large by comparison to others who were much more experienced and making smaller and smaller versions of the N64. But this time, I found that the basic concept and processes of the project were flowing much faster than before and not only that, but the quality of the progress was equally impressive. I dare say though out of the 6 weeks it took for me to construct this from the ground up, 2 weeks were spent just waiting on parts! Progress was quick and as I started to see things take shape, I began to gain a bit more confidence in what I was doing and started to get thinking a bit out of the box. The case construction on this was going well. My vacuum former was rocking, the technique was being tuned and my “Frankencasing” skills were starting to really take shape. For those of you unaware, the term “Frakencasing” is the art of taking multiple parts from different components and applying them to one base unit, filling, sanding and then painting to make a seamless custom casing with factory machined components. 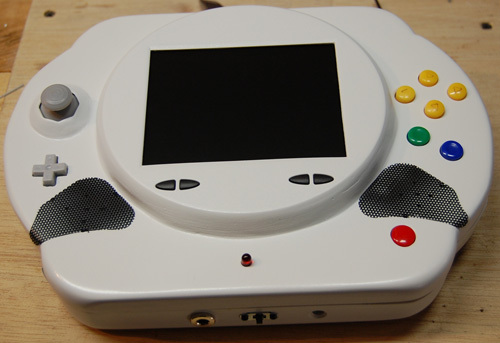 For example, this case had the D-Pad and control stick mounts from a Game Cube controller, the C’s, A, B and Start button from a Superpad controller and the bezel of a Zenith PS1/PS2/X-box screen. Once this process get’s fine tuned than the results start to speak for themselves! Then, on May 6th, 2010 I posted a completed showcase log on the forums of Ben Heck. Later that day it was picked up on a French Tech Website called “NoWhere Else” and a full review for the masses was done. But it wasn’t until May 7th the most unexpected and most rewarding experience a Modder could have, “The Nimbus 64” made it to a website called “Engadget”! Perhaps the most prominent tech website in the world, to have a project article on Engadget meant that the whole world was soon to know about your work! Because not only is their daily following massive, but smaller tech sites from around the globe take posts from there and posts links or reference stories back the original article! Needless to say, I didn’t get a whole lot of real job work done that day as the hits, comments and video plays just started to pour in! Although my video only got about 4 to 5000 hits from the initial posting (mainly because Engadget did not post the video like they usually do for some reason) the web presence of this unit was incredible! Even today if you Google “The Nimbus 64” you will have thousands of hits just with that name, most reverting back to the Engadget article, but also a lot of smaller reviews from other tech websites which even a year and a half later I still love to read! But I had had a taste of fame for a second…something that I had longed for with my music career and in one video, I got more attention than any of my CD’s, Live Video’s and web stats with my music over a 4 year period of trying! So the want to continue and get that again has been strong and quite persistent. Maybe one day even this Blog/Site will turn into a new hangout for new and old Modders alike. We can only see! How can I get one. Do you make potables and sale them?